George Bernard Shaw and West Lebanon’s Margaret (Maggie) Tangway may have never crossed paths during their lifetime, but the legendary Irish playwright, critic and polemicist wrote a quotation that was tailor-made for the incomparable 93-year-old diva. 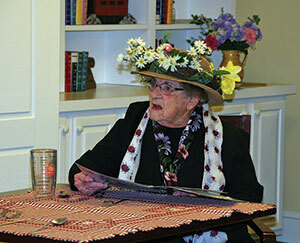 A sense of humor and making others laugh have been a mainstay for Maggie who has resided at the Quail Hollow Senior Living Community since 2010. 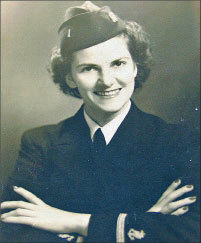 Those traits carried the lively lady through a stint as an Ensign in the United States Navy during War World II. It also guided her through the painful loss of her husband and soul mate Jean Tangway, who had also served during World War 11 and had survived the Japanese attack on Pearl Harbor. Later she would suffer a parent’s worse nightmare, the tragic loss of her son Phillip, to a cancerous brain tumor. Through it all, it was her love of humor that served as a crutch over that rough terrain. These days Maggie continues to practice what she preaches. She is well known for her performances where she plays the organ and dishes out one-liners that bring the house down. 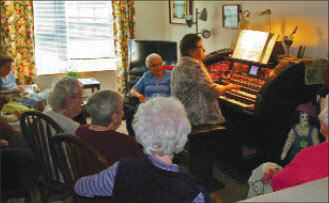 In addition, every Wednesday afternoon she opens her home to fellow Quail Hollow residents (and anyone in the vicinity) for a concert of favorite melodies from days gone by. “I would not like to live next door to me, would you?” she asks with a devilish grin. 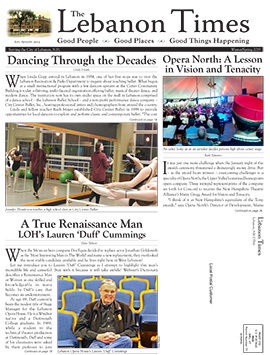 Recently she and a few of her cohorts staged a comedy routine entitled “Maddie and Paddie” playing the part of a married couple dining out for the evening and encountering a surly waiter. The skit had the audience roaring with laughter and Maggie was in her element. Maggie simply has a fascinating background that possesses a solid connection with Lebanon, N.H. She was a graduate of Lebanon High School with the class of 1940. Originally born in Boston, MA in 1922, her parents moved to the Upper Valley and bought a farm in East Plainfield. After graduating from high school, Maggie was accepted at the Peter Brigham School of Nursing affiliated with the Peter Bent Brigham Hospital in Boston which was founded in 1913. From there she was commissioned as an Ensign in the United States Navy and served a three-year stint during World War II. “My husband Jean had been discharged before the end of my service commitment so we had a different arrangement. While on active duty, I would come home on leave to visit him. Usually it was the other way around with couples.” she chuckled. The Tangways’ military service made a lasting impression. After leaving the Navy, Maggie continued her career in nursing which had always been one of her passions. Maggie and Jean were married in 1946 and had three children, Nancy, Barbara, and Phillip. The two girls are now in their 60s while Philip was recently lost to a brain tumor. Jean passed away in 1995. To get a proper perspective on Maggie’s 93 years on this earth, consider this… The year she was born (1922) the following events took place: The first edition of the Reader’s Digest was published; Mussolini became the leader of Italy; Construction began on Yankee Stadium; Joseph Stalin was appointed General Secretary of the Communist Party.